As described in Section 3.4, there are a number of different causes of deterioration of steel in the marine environment. There are also many methods for the repair and maintenance of steel piles. Selecting the method to be used depends on: (1) the extent of the damage, (2) economics of the repair, and (3) physical and environmental factors at the site. The pile plays an important role in the integrity of the overall structure and deterioration can result in serious reduction of the capacity of the pier or structure. Therefore, it is important that an engineering structural analysis be conducted to verify that the repair method will provide the needed structural support for the intended application. CAUTION Before beginning construction operations, block off construction area from all traffic. Notify port authority to secure marine traffic in the area and obtain clearances to proceed from appropriate local authority. (2) ensure a minimum (1-1/2 indies) distance between pile and reinforcing steel and reinforcing steel and form. Each form manufacturer provides detailed instructions relating to installing their specific designs. Both flexible and rigid forms are available and manufacturers are listed in Appendix A. Forms may also be fabricated from materials on site. Selecting the form type will depend primarily on availability and choice of the designer or construction crew. Flexible forms fabricated from a porous fabric are usually left in place. Both open and closed top models are available. Open top fabric forms are usually suspended from the piling or overhead structure. A method for suspending open top flexible forms from sheet H-piling is shown in Figure 2 of Table 5-7. Open top forms are filled to overflowing. The concrete grout fill is topped with an epoxy cap or nonshrinking grout at a 45-degree angle as shown in Figure 5-17. Rigid forms are open top and bottom and are normally removed and reused after the concrete has completely cured. Rigid forms can be commercial or fabricated from material found at the construction site. Translucent form jackets are recommended, as they provide the ability to view the level of the concrete, and to make corrections if there are any discontinuities in the repair material. Rigid forms require a bottom seal and base plate to hold the form in place. A temporary friction clamp and base plate conforming to the pile contour can be fabricated and attached to the pile at the bottom of the repair area (Figure 3 of Table 57). The rigid form rests on the base plate to form the bottom seal which prevents leakage of the concrete. Problem: Slight to moderate deterioration (less than 35 percent) of the cross-sectional area has occurred; or protection against corrosion and abrasion is required. Description of Repairs: Flexible or rigid forms together with reinforcing are used to provide a concrete encasement around damaged pile. Follow form-manufacturer's directions. Install casing extending from 1 foot above MWH to 1 foot below mudline. • Clean the steel pile of marine growth and loose rust. Use high-pressure water blasting if necessary. • Install steel reinforcing mesh around the pile, using spacers to provide minimum 2-inch clearance between the pile and reinforcing, and between form and reinforcing. 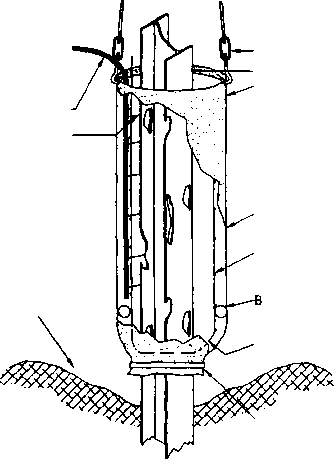 • Blocking between form and pile (Figure 1) may be needed to seal bottom of form and prevent concrete leakage during filling. • Pump concrete using 15-psi minimum pressure through suitable pipes or hoses extending to lowest point. Keep discharge end submerged in concrete. Flexible Form Closed Bag Type: Figure 1 - Wrap the form around the pile with blocking at bottom; close zipper; secure form to the pile at top and bottom with mechanical fasteners or banding. Insert fill tube to bottom of bag and fill to overflow with concrete. Flexible Form Open Top Bag: Figure 2 - Suspend fabric form from structure or friction clamp as shown in detail using turnbuckles, or chains to steel hanger ring. Install blocking and secure form to pile at bottom using banding or clamps. Fill with concrete. Rigid Form Open Top: Figure 3 - Fabricate and install base plate to seal bottom and hold form in place. Install bands every 12 inches; install pump band at lowest possible point. Fill form with concrete grout pumping through lower pump band. 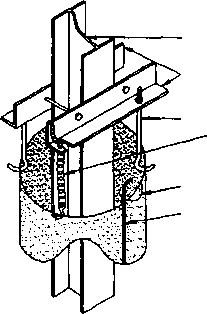 Vibrate form to ensure full concrete placement within form. Leave forms in place; remove bands only after concrete has set. Backfill mudline. Cap open top forms with epoxy grout to provide a 45-degree cap. Application: The method will not restore full bearing capacity lost due to deterioration. 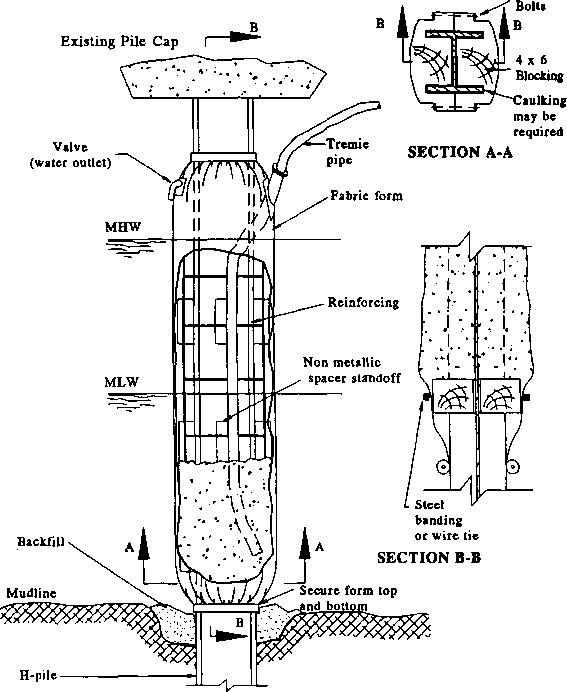 Partial restoration may be gained by bolting steel angles, channel or plate to the piles before the concrete encasement (Figure 4). Obtain engineering guidance for strengthening requirements. Table 5-7 Figure 1. Flexible form closed bag. Figure 2. Open top form arrangement. How to form a seal around concrete pile underwater? 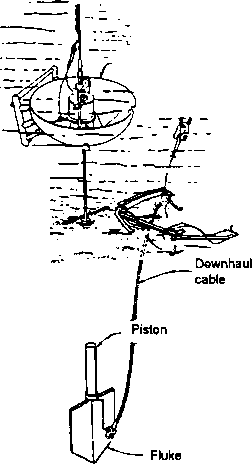 How to repair steel h piles underwater?